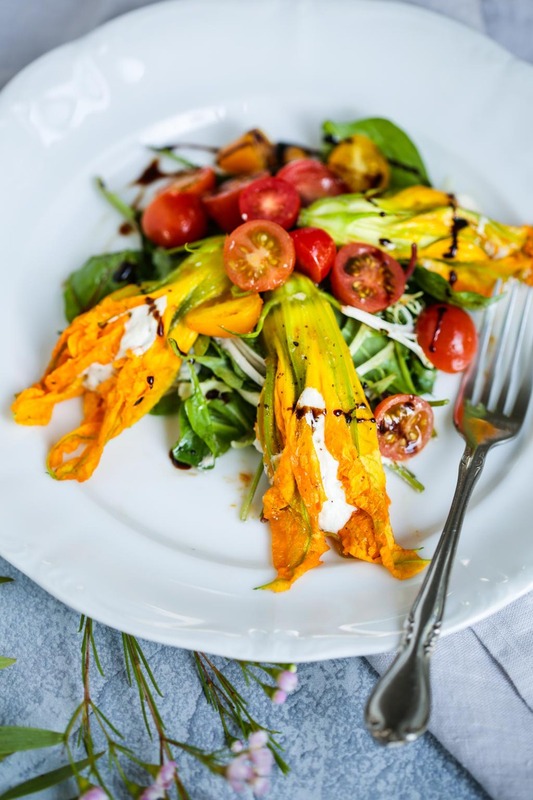 Although squash blossoms are usually a summer treat, I have seen them in my local grocery lately and decided to go ahead and make a dish with them! Squash blossoms are delicious on their own, but are stunning when they are stuffed. They are delicate, colorful and unique. Make sure that you remove the stamen of the flower and the stem, as they are not very good to eat! Try making a platter of these or serving them on top of salad as I’ve done here! To make the salad, toss the baby spinach and cherry tomatoes in the olive oil and lemon juice. Season to taste with salt and pepper. Divide between 2 plates, and set aside. For the Cashew Ricotta, rinse the soaked cashews and discard the soak water. Place the cashews in a food processor and add the apple cider vinegar. Process until the cashews are creamy, adding water as needed to help achieve the texture of ricotta in the food processor. Taste and adjust seasoning by adding salt and pepper to taste. Remove from the food processor and place in a container. Stir in a little more water (little by little) until you get a chunky cottage cheese texture. Set aside until ready to use. To stuff the zucchini blossoms, put the cashew ricotta in a ziplock bag. Open the zucchini flower (I had a friend help hold the flower open) and cut off the stem and pull out the stamen of the flower. !Take the bag of the cashew ricotta and snip off one of the bottom corners of the bag. Quickly place the open tip of the plastic bag inside the flower and squeeze out some ricotta until the flower is filled as desired. 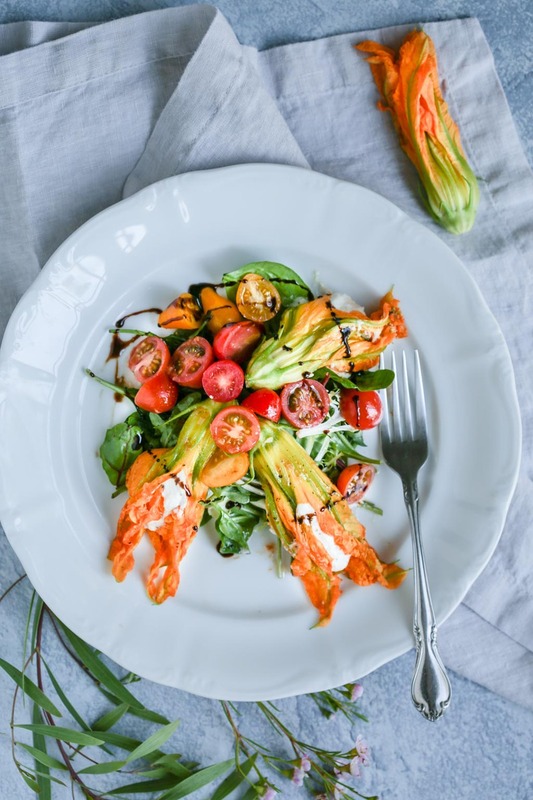 Carefully place the stuffed flowers onto the bed of dressed greens and tomatoes. Drizzle with balsamic glaze and a little olive oil.